The Witcher 3's Geralt Enters Monster Hunter: World | Nerd Much? We’ve been wondering for a while now what form The Witcher 3 and Monster Hunter: World crossover would take. And after seeing today’s trailer, color us quite impressed. Many fans presumed this The Witcher 3 and Monster Hunter: World crossover would simply be an armor and weapon update of sorts. But Capcom has done much more than the bare minimum (see: Resident Evil 2), releasing an all new quest line available to players who have reached Hunter Rank 16 or above. 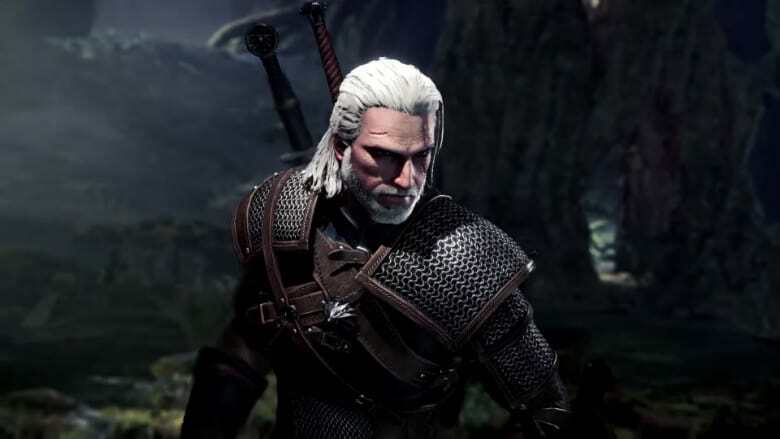 Today’s The Witcher 3 and Monster Hunter: World crossover trailer also confirms that Geralt’s original voice actor, Doug Cockle, reprises his role as the titular character. We see Geralt enter the realm of Monster Hunter: World via a portal and then embark on a journey to track down the reasoning for the hostile behavior of the local wildlife. The Witcher, of course, tracks down his foe. It’s a creature dubbed the Leshen, which Geralt looks as though he is capable of taking down with relative ease. The creature looks to later evolve in something called the Ancient Leshen though. An enemy we anticipate being a bit tougher to dispatch. Ciri too is tagging along within The Witcher 3 and Monster Hunter: World crossover. The character is playable in the Contract: Woodland Spirit quest, which also comes with similar rewards upon completion. All of this The Witcher 3 and Monster Hunter: World crossover content is free to download right now on PlayStation 4 and Xbox One. The patch will be coming to PC as well at a later date.